Ahead of today's opening session, the air temperature is 21 degrees C, while the track temperature is 33 degrees. Although it is bright and sunny, there are some dark clouds on the others side of the mountains that surround the Principality. This being Monaco, with all the inherent risks, there are no reserve drivers on duty. The conditions, not to mention the debut of Pirelli's new hypersoft tyre means this year's lap speeds could be the fastest ever witnessed here. 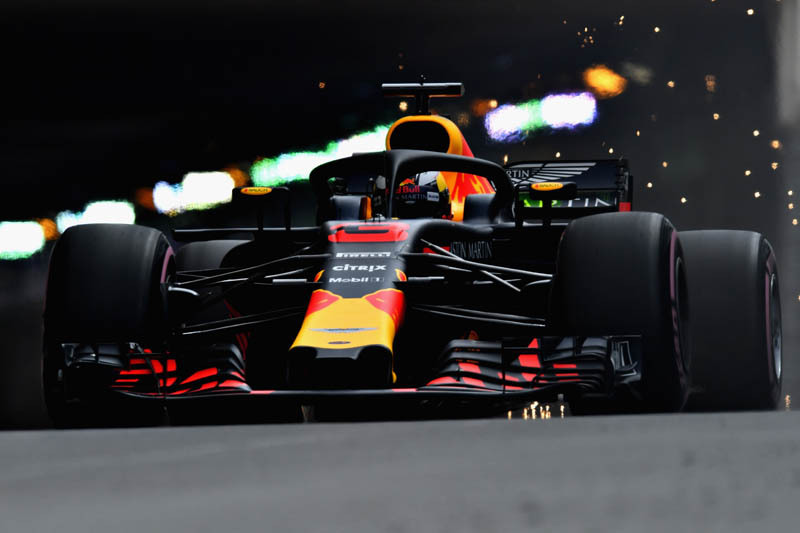 While the general opinion is that Mercedes really is the underdog here, and Red Bull possibly favourite, at least two drivers really need to come away with a decent result this weekend, Romain Grosjean and Brendon Hartley. Then again, Williams really needs to start putting some results together, the Grove outfit currently last in the team standings. Alonso gets proceedings underway, followed by Ericsson, Leclerc, Magnussen and Sainz. As more drivers head out there is a mixture of hypers and ultras while Alonso is on the supersoft. Soon all bar Perez, Hartley and Verstappen have been out. "Steering feels strange," reports Hulkenberg, "feels really, really light." The Mercedes and Williams duos waste n time in getting down to business, Bottas posting the best time of the four as he stops the clock at 1:15.780. A 15.229 sees Hamilton go quickest, the Mercedes pair on ultras and the Williams on hypers. Hartley is the fifth driver to post a time, the Kiwi starting off with a conservative 20.892. Meanwhile Bottas improves to 14.882. As Hartley improves to 18.372, Hamilton goes top with a 14.749. Hartley is told that he pressed the DRS by mistake and that he has an issue when downshifting in T6. Eyes in the cockpit. As the Mercedes pair continue to swap positions at the top of the timings, Hamilton is warned that traffic is building. A 15.289 sees Ricciardo go third as mechanics are working on the suspension on Raikkonen's car. Next time around, Ricciardo, on the hypers, posts 14.103 to go quickest by 0.244. Just 16 minutes into the session and there are 14 names on the board, the Sauber, Force India and Ferrari duos all yet to post times. Somehow, Sirotkin hits the barrier on the pit straight. Despite a very wobbly right-rear the Russian circumnavigates the entire lap and makes it back to the pits. Nonetheless, that will require a fair amount of work, not least a new floor, so we are unlikely to see the Williams again for some time. As the Ferraris head out, Verstappen posts 13.975 to go quickest. Raikkonen posts 15.296 and Vettel 22.115 as the Maranello pair finally get to work. Ricciardo retakes the top spot with a 13.744, but no sooner has he improved again with a 13.665 than Verstappen responds with a 13.299. A 15.152 sees Gasly go fifth, just ahead of Raikkonen, with Toro Rosso teammate Hartley in seventh. Shortly after the Kiwi improves to fourth with a 14.379. Vettel improves to third with a 14.232, but remains 0.977s off Verstappen's pace. Not for the first time this season a piece flies off of a Haas (Magnussen), the drivers behind doing well to avoid it. Hartley complains of poor traction... on the hypers. Grosjean has a slight brush with the walls. After almost thirty minutes of running, Bottas (fourth) is the highest placed ultrasoft runner. Quickest in the first two sectors, Verstappen goes quickest with a 12.941. Told that he can do three more laps, Vandoorne replies: "OK, but the car is quite undriveable". Teammate Alonso is currently a spectator as his crew works on a brake issue. The Spaniard is currently last having only completed 5 laps. Another improvement from Verstappen who posts 12.723. "We're only a third of the way through FP1 and already we're only a second away from last year's pole," says Pirelli, "so expect those records to tumble." It is revealed that following a thorough investigation, McLaren felt it was not safe to run Alonso and will need to remove the floor to find the cause of his brake problem. The track falls silent as the drivers head back to their garages and the extra set of tyres is handed back to Pirelli. Currently it's: Verstappen, Ricciardo, Vettel, Bottas, Raikkonen, Hartley, Sainz, Hamilton, Gasly and Ocon. Following a brief lull, Bottas gets the session underway again, the Finn back on the hypers. Following his earlier issue, Sirotkin is back on track. In the Red Bull garage, mechanics are swarming over the rear of Ricciardo's car. Hamilton splits the Red Bulls with a 13.038 but remains 0.315s off Verstappen's best. Bottas also improves but remains 0.799s off the pace. A 12.480 sees Hamilton go quickest, awesome pace for so early in the weekend. Not for the first time this year, Stroll is unhappy with the balance of his Williams. "I'm really not happy with the balance right now, I can't go quicker," he says. The Ferrari pair improves to go fourth (Raikkonen) and fifth, but moments later, as Vettel leapfrogs his teammate with a 13.041, Ricciardo splits them with a 13.139, the Australian's issue clearly resolved. Both McLarens and both Haas' currently sidelined. Grosjean's car being repaired after his brush with the walls while Magnussen has a fuel injection issue. While Alonso has a brake problem, the cause of Vandoorne's undriveable MCL33 is under investigation. Worth noting that neither team has run the hypersoft rubber as yet. A 12.336 sees Verstappen retake the top spot, the Red Bull driver subsequently improving with a 12.280. "I just backed off because I touched the apex wall," admits a sheepish Ricciardo. Meanwhile, teammate Verstappen heads off down the escape road (such as it is) at T1 following a major lock-up. Ricciardo's bid to improve is dashed when Stroll makes a late decision to pit. Verstappen is under investigation for rejoining the track in an unsafe manner following his off at T1. Rather than spinning the car around, the youngster reversed back on to the track ahead of one of the Ferraris. Ricciardo improves to 12.336 but remains 0.056s off his teammate's pace. "I touch a bit with the car," admits Ocon following a close encounter. Verstappen is out of his car, as Ricciardo goes quickest in S2, the Australian finally crossing the line at 12.126 to go quickest. Other than the Australian, the only other drivers on track are Sainz and Vandoorne. Hamilton is told that Bottas is struggling with his front end. With just over ten minutes remaining Alonso is back on track. Grosjean also. "The fronts go away, it's getting to the point where I can't even turn the car," reports Stroll. A slight case of exaggeration there one suspects. Members of the crew form a wall as their colleagues work on Ricciardo's car. Alonso improves to 18th with a 14.793, the Spaniard clearly relieved merely to be running again. "Alonso being a **** there," says Hartley as he loses time behind the Spaniard. Grosjean improves to ninth (13.943) on the hypers. Vettel and Raikkonen head out for a late run. As the session winds down all bar Magnussen are on track. Close up shows massive graining to Vettel's fronts. As the session end, the drivers head to the grid for those all-important practice starts. Ricciardo is quickest, ahead of Verstappen, Hamilton, Vettel, Raikkonen, Sainz, Bottas, Perez, Grosjean and Sirotkin. Ocon is eleventh, ahead of Hartley, Hulkenberg, Gasly, Vandoorne, Leclerc, Alonso, Ericsson, Stroll and Magnussen.